Chanukah is around the corner. Eight oily nights of fried latkes and donuts are plentiful, waiting to tempt the healthiest of eaters. If you’re looking for a low-carb alternative to these fatty delights, check out my Rutabaga and Turnip Latkes featured in The Jewish Week a few days ago. If you still want that fried flavor but want to cut the potatoes, Onion Bhajis are a delicious Indian treat that were commonplace in our home when I was younger and thanks to today’s guest blogger, Veggie Zest, I can share an authentic Onion Bhaji recipe with you. Just a few weeks ago, I was browsing the pages of Food My Friend (who also happened to make Onion Bhaji’s this week) I discovered Veggie Zest, and was impressed both by the photography, and the extensive collection of vegetarian food. I love the way my house fills with the rich Indian aromas when cooking dishes from this part of the world, and more than that, I love the way each and every bite can deliver a rich balance of spicy and sweet flavors. Indian food is a favorite of mine, and it’s a pleasure to introduce Pallavi of Veggie Zest to you today. 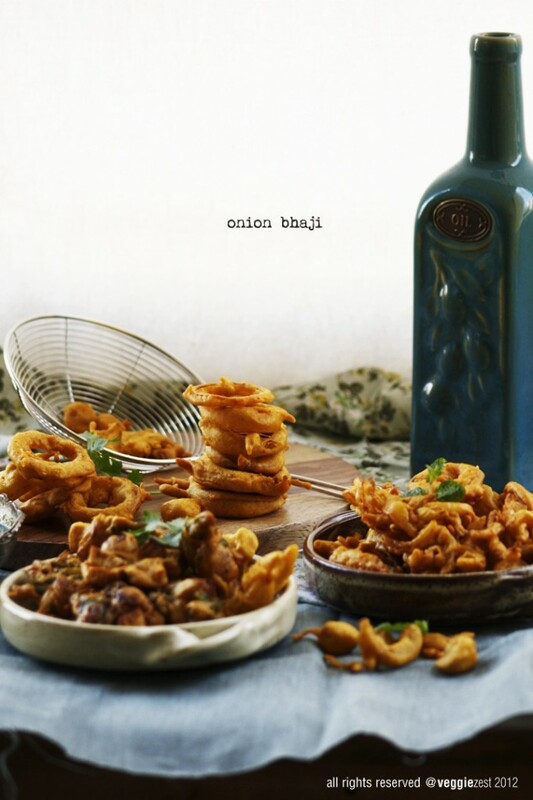 I am very happy to do this guest post for this beautiful blog, This American Bite, and I am very excited to share the recipe for a very famous Indian street food: Onion Bhaji. Yosef likes it, and so do I! 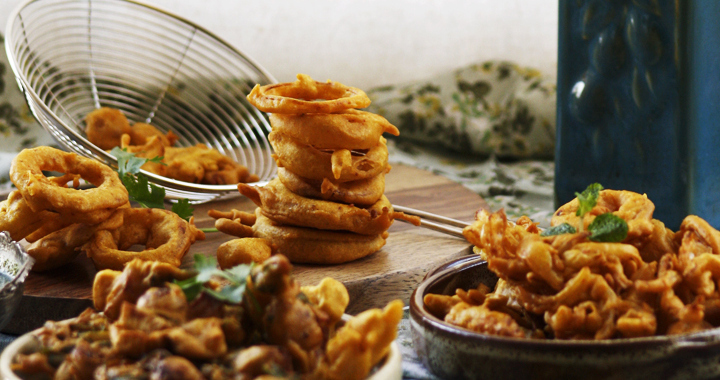 Onion bhaji is a very famous Indian street food that’s available in pretty much throughout the country. Its inexpensive, its deep fried and it tastes awesome. 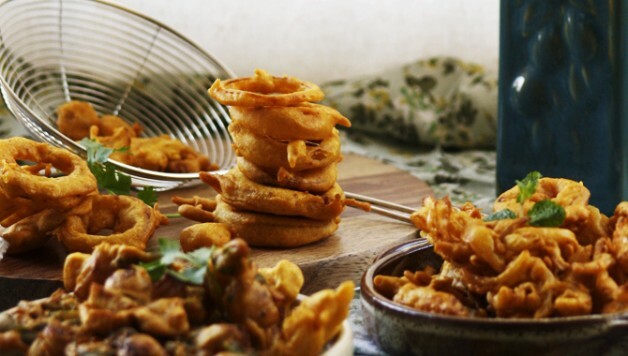 Bhaji or pakora is basically a fritter but instead of all purpose flour the onions are dipped in a batter of gram flour mixed with some spices. 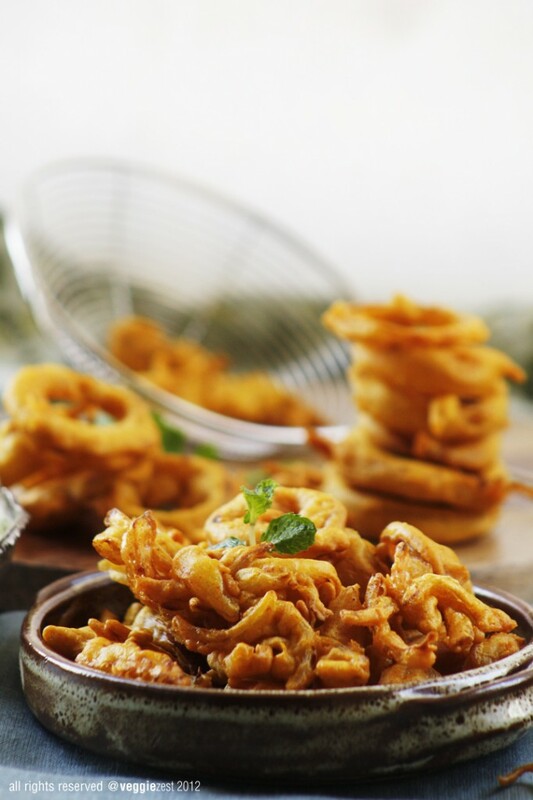 Although in India bhaji is made with many vegetables – cauliflower, potato, cottage cheese etc, but somehow onion bhaji has gained the most popularity internationally. It’s my personal favorite as well. The sweet flavor of onion combined with a crisp coating of gram flour seasoned perfectly with spices like cumin, coriander and turmeric turns it into a pretty addictive snack. Traditionally the baji is served warm with either spicy cilantro chutney or sweet tamarind chutney. 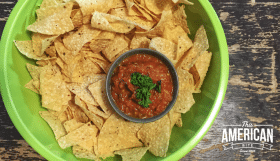 To make it simple you can even serve it with ketchup. 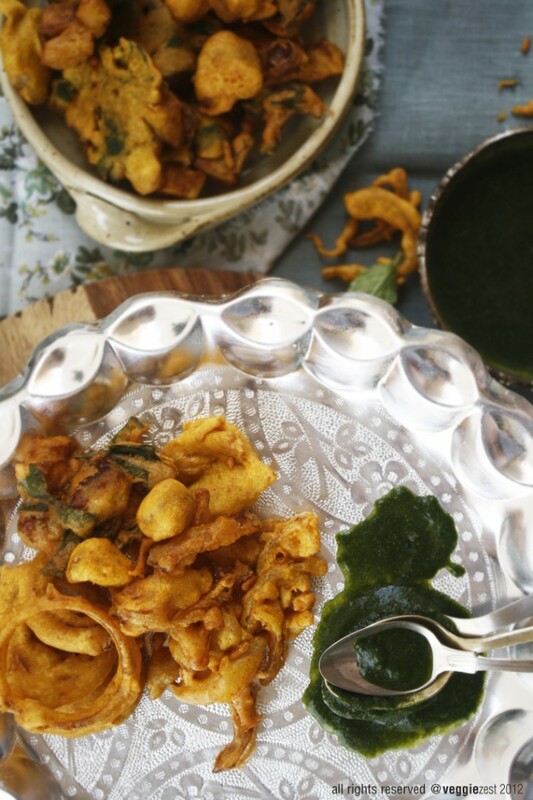 Since this dish is so famous, I have actually seen and read many variations for the recipe – most of them made the process of making bhajis sound confusing and complicated. 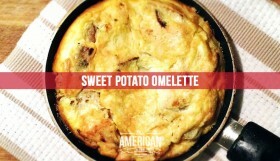 On the contrary the batter of this recipe is actually pretty simple and very quick to make. 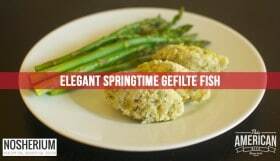 You just need to use gram flour which is basically flour made out of chickpeas or garbanzo beans and season it with some spices and then add water to form a batter. Just dip the onions in the batter and deep fry them till they turn golden. 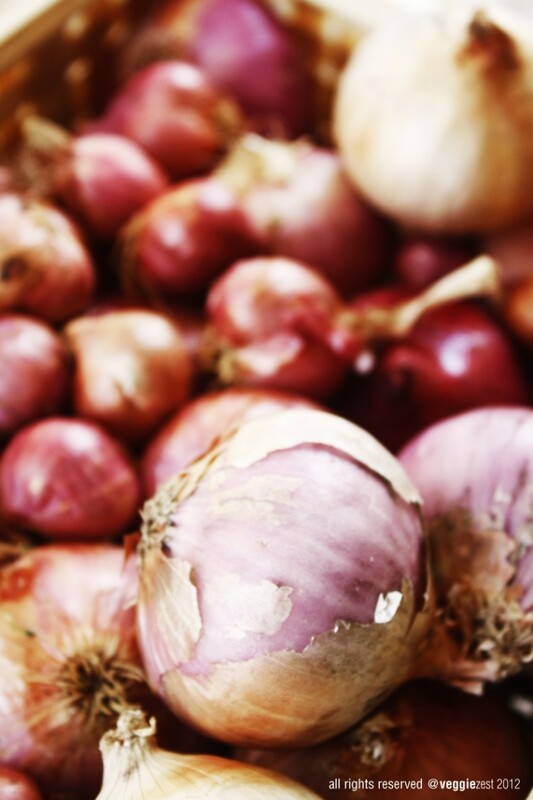 There is no rule to cutting the onions but thinly slicing is the most common way for making bhajis. You can also slice it into rings and make it like onion rings. Another variation that I really like is when you roughly chop the onions and mix it with potatoes (cut into the same size) and cook them together more like a free form dumpling. There are many combinations that you can try – but I suggest starting with the classic version. Heat oil in a wok on medium high. In a large bowl mix gram flour, cumin, coriander, turmeric, salt and (optional) asafetida. Slowly add water while whisking the mixture to form a batter. The batter should be thick enough to coat the onions. Add an extra tablespoon of water if you feel the batter is too thick. 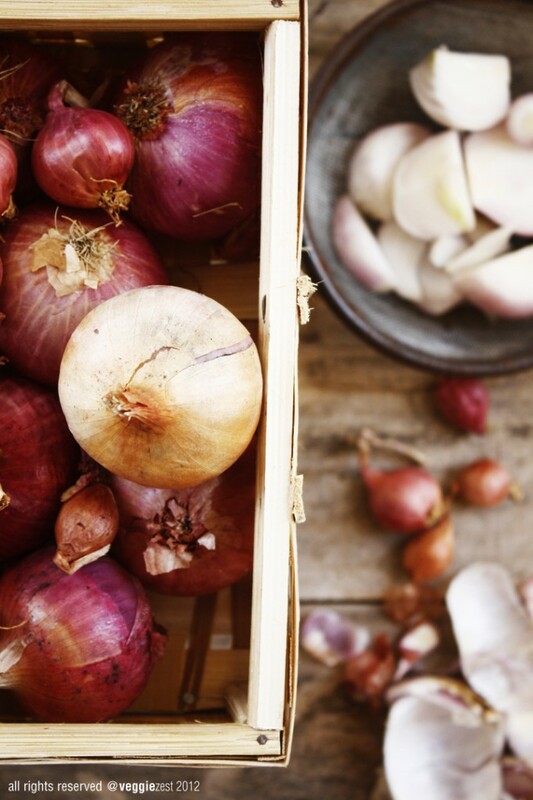 Add some sliced onions to the batter and mix so that the batter coats the onion evenly. Using a spoon, take a spoonful of onion batter mixture and place in the hot oil. Be careful while frying as the oil will be very hot. Turning occasionally deep fry the fritters till it turn golden on both the sides. Remove from the oil and let cool on the paper towel. Serve warm with cilantro chutney (see recipe below the photos) or ketchup. 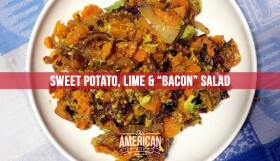 In a blender add cilantro leaves, mint leaves, salt, sugar, lemon juice, green chili and blend on high to form a puree. Add a little water if the mixture is too thick. Add ketchup and blend again. Taste the chutney and adjust the seasoning as per your taste. Let the chutney rest for 30 minutes before serving.